“Barbecue and tailgating are such a natural fit,” says Sweet Cheeks chef-owner Tiffani Faison. “It’s hearty, it’s totally unfussy, and you can start eating, watch the game, and just pick at it all day.” Especially when it comes in heaping portions as part of Sweet Cheeks’ “Football Feasts.” The themed packages range from the “Big Game Supper,” a spread including pulled pork, sausage links, chopped beef, biscuits, and sides, with enough food for up to 15 people, to “Bonez for 4” (1, 2), featuring pork ribs, a dozen smoked chicken wings, and a bucket of fried drumsticks. “People stop here on their way to Foxboro a lot,” she adds. Moody’s Deli owner Joshua Smith is serious about tailgating—on game days, you’ll find him presiding over an epic feast in the back of Parking Lot 6 in Foxboro—and his catering options make it easy to follow his lead. Work with the chef and his team to assemble a custom charcuterie plate (3) from Smith’s own Waltham-made line of cured meats (think: ’nduja, pastrami, and mortadella). Other party-ready to-go options include sandwich platters and Smith’s homemade jalapeño cheddar-wurst and bratwurst (4). Just stuff ’em in the bun once you reach the parking lot for an upscale spin on classic game-day sausage and peppers. With a name like Mass Hole Donuts, home-team-themed bites are a natural fit for Alex Mansfield’s Boston-area pop-up bakery. Come football season, his pigskin-shaped doughnuts (5) get the GOAT treatment—that is, dipped in a gooey goat-cheese caramel and drizzled with vanilla icing. In other seasons, Mansfield sells “Green Monster” doughnut holes and Bruins-inspired treats (chocolate rounds covered in golden passionfruit icing) alongside other decadent flavors. “We’re trying to make people realize that they should be proud to be a Masshole,” he says. Gourmet versions of pizza, birthday cake, and burgers: “We have jokingly said our whole menu is a kids’ menu,” says Superfine co-owner Chris Robins. In other words, it’s great party food. All three of the restaurant’s North Shore locations offer themed to-go meals for a hungry crew of eight to 10. 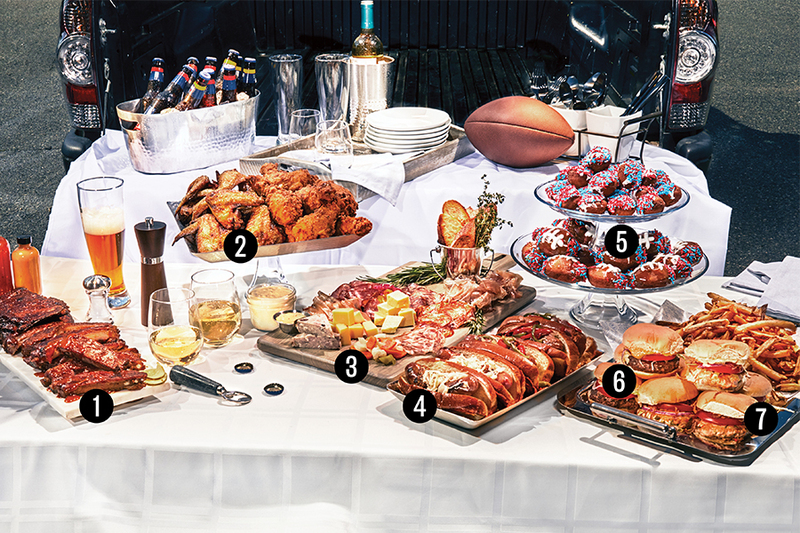 “The Complete Package,” for instance, boasts such hearty tailgating-ready fare as saucy meatballs, whiskey-glazed ribs, and a basket of Brandt beef burgers slicked with house-made Thousand Island dressing (6), while “The Healthy One” includes smashed-avocado dip with pita chips and a basket of yuzu-aioli-topped fish sliders (7).